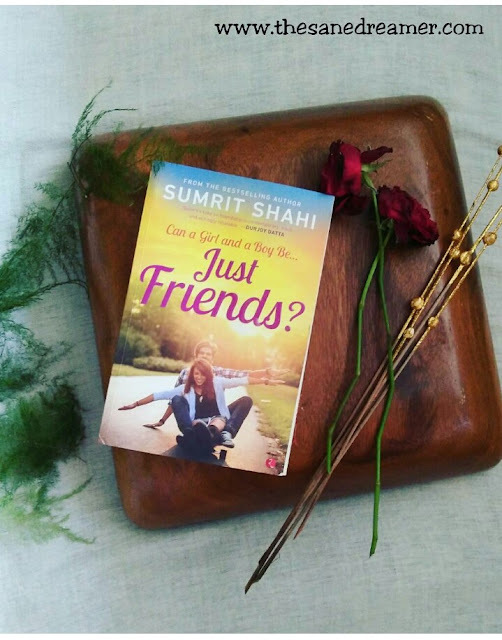 Book Review: Can a Girl and a Boy be Just Friends? Can they be just friends? I mean a Boy and a Girl? This is a universal quest everyone is trying to find seek. Some say they can, while the rest says it's not possible. I am asking you this because the title of the book I will be reviewing today is based on the stereotypical phrase, "Can a girl and a boy be Just Friends?”, This was the first novel the author Sumrit Shahi wrote and his name is quite a synonym because of his venture into the TV show which is a youth-based program called Sadda Haq - My Life, My Choice, that airs on Channel V India, find more of his TV work here. To begin with, let me start with my own view, I do believe that a girl and a boy can be just friends. I mean, I have few guy friends whom I am close with, not that I have ‘Friend zoned’ them but we kinda click very well as being 'Just Friends.' Am sure it might be totally contrasted for some, but I am stating my personal experience here. This book narrates the story of a typical boy and girl who are best of friends and each one of them knows everything about the other, later they fall in love and complication follows thereafter. Cliché ain’t? The story will take you on a journey of their younger days in schools, their friendship, crushes and first love experience etc. I felt the story was kinda stretched in the beginning with the flashback narration and all, so readers who are impatient will find it boring till they reach the climax. However, it is worth reading till the end. Just Friends is divided into two parts, narrated by two different people, which somehow shares a similar plotline. The first one is about Aaryan and Ishita who are distant lovers, and Boza who is Aaryan’s BFF and she eventually falls in love with him. The second story is about Tania and Sumer with their respective partners Rehaan and Liaka which has the same twist of Lovers Vs Friends Vs Lovers Vs Best friend. Both the stories connect when two people (Tania and Aaryan) meet at the airport and share their parallel love stories with each other. Since the author wrote the novel when he was 17 years old, the languages he used are simple to understand and the plots were all about school’s life and relatable situations like bunking classes, group studying, hostel’s life, exam fever and so on. I won’t quite go into the details as it will spoil the suspense, maybe you should find it yourself. However, one thing is for sure, don’t go by the title because it didn’t really answer my query. It is a story which is about the relationship between a boy and a girl, their close bond which in turn become each other’s habit. And if you don’t agree with me, you can surely take the example of Joey and Phoebe from Friends. They were best of friends, yet they didn't end up as lovers, right? Period. Book Details: Can a Girl and a Boy Be... Just Friends? The opinions expressed are my very own.